A few weeks ago I wrote about adding a Bismarck palm (Bismarckia nobilis) to the garden in front of the garage. It was an even bigger hit than I expected and there are a lot of fans of the Bismarck palm around. "Everything is bigger in Texas" applies to insects as well. This native Texas Giant Walkingstick (Megaphasma denticrus) is quite appropriately the longest insect in the US. These walkingsticks can grow to 7" (177 mm) though the body on this one is just over 4" (101 mm). This one is most likely a young male according to my research, and just one in 1,000 is male. This little pile of acorns probably doesn't look all that fascinating to those of you who garden in other parts of the country. Next in my series of The ABCs of Plants in My Garden is Velvetpod Mimosa or Mimosa Dysocarpa. Mimosa? Isn't mimosa invasive? 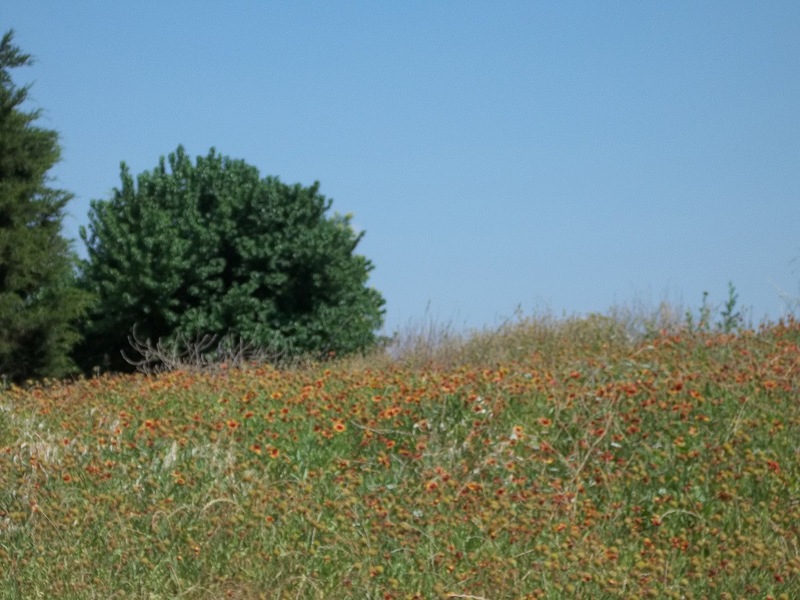 Mimosa Dysocarpa is a Texas native plant and is not considered invasive. Invasive mimosa (Albizia julibrissin) is an asian native brought over in the 18th Century which has escaped cultivation. 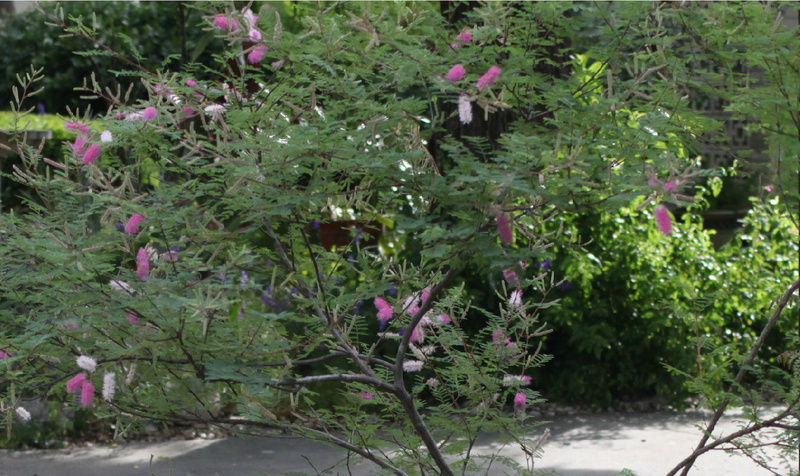 Native Mimosa dysocarpa is deciduous and extremely drought tolerant. While it likes direct sun and reflected heat, it also does well in part shade. The photo above is from Ragna's garden this past spring. Mine is about 8" tall and in the gravel bed next to the garage where it gets mostly sun with late afternoon shade. Ragna generously shared a rooted cutting from her plant about two years ago. The gorgeous spring flowers are pink cylindrical brushes. The bright pink flowers fade to pale pink and white. Mimosa dysocarpa has a shrub-like form which matures at about six feet (1.8m) tall. The native range is west Texas extending across New Mexico to Arizona and south into Mexico. It's also called Catclaw or Gatuno for the thorns along the branches. This special native plant when mature will be a bright spot in the front garden against the stone garage wall. This doe knows how to make me forget about all the "deer resistant" plants devoured overnight. Just bring this little cutie around for a visit. Stand watchfully by as I take a few pictures. Give me just an extra moment with the camera before you react to the shutter, flip your tail, and run off into the woods. A few minutes later the fawn is back to drink from the basin we keep filled for all the wildlife and birds around here. Yes, they are cute (sometimes) and, no, I can't stay mad at them (for more than a day or two). Otherwise this blog would be Rock-Oak-More Rocks. 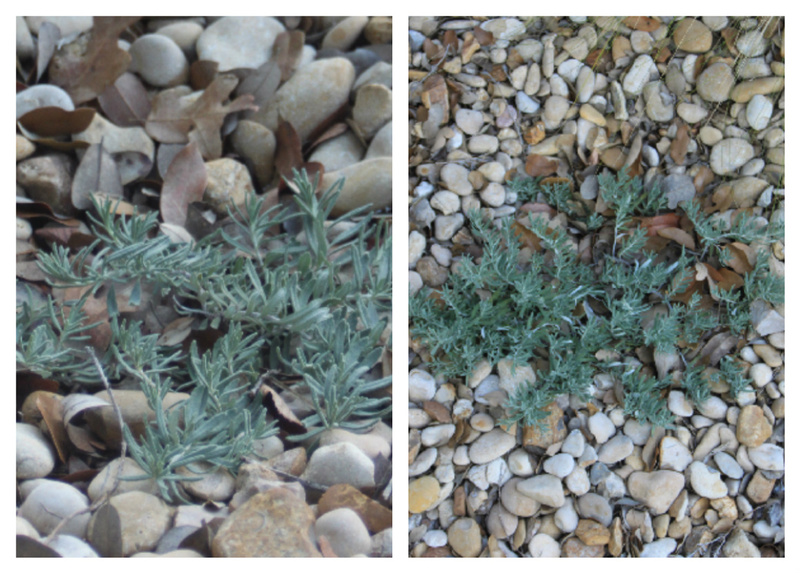 In December 2011 I wrote about my hopes for "Leap Year" in my front garden which was re-planted about three years ago. As the saying goes perennials follow a three year pattern of "sleep, creep, leap" and with this being the third year for much of the front garden I had high expectations. Intending to write the halftime report in early July, I found that things were not going well out there and decided to wait. Some parts of the garden don't look that much better in the heat of August so it's time to be realistic and assess what did not go right and needs to be corrected this fall. Overall the front looks good, especially for August in San Antonio. The garden area nearest the front door was planted three years ago and was almost immediately hit with two years of record freezes and drought. That's where I'll focus in this post. 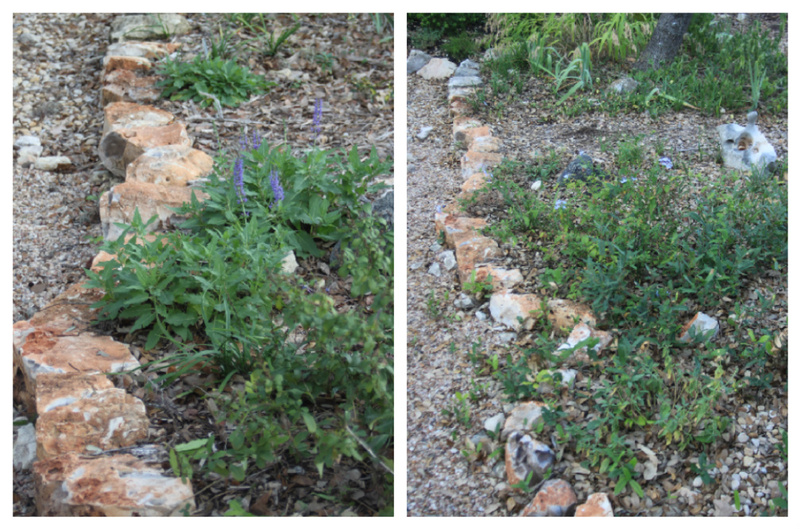 The Blue Hill Salvia (Meadow Sage) was meant to grow over the low rock terracing, but has died back again in the heat of the summer so I plan to add Nepeta 'Walkers Low' which thrives in the summer heat. Oak sprouts are a fact of life under live oak trees and spring rains brought on a bumper crop. The Inland Sea Oats (Chasmanthium latifolium) should have been divided last fall and are splayed outward from an empty center. They will be divided as soon as the weather cools. I'm reworking this entire bed around the tree since the iris get too much shade in early spring to bloom properly here. Salvia 'Indigo Spires' (right of the tree) bloomed well in the winter but continues to wilt every afternoon in the summer. The bed of white blooming and silver foliage plants has filled in a lot. But the oaks have also filled in so the bed gets too much shade, so the plants are not blooming. The best bloomer here is the white Plumbago (Plumbago auriculata 'alba'). Most of these plants will be relocated and I have plans for a sedge "lawn" which should do well in partial shade. 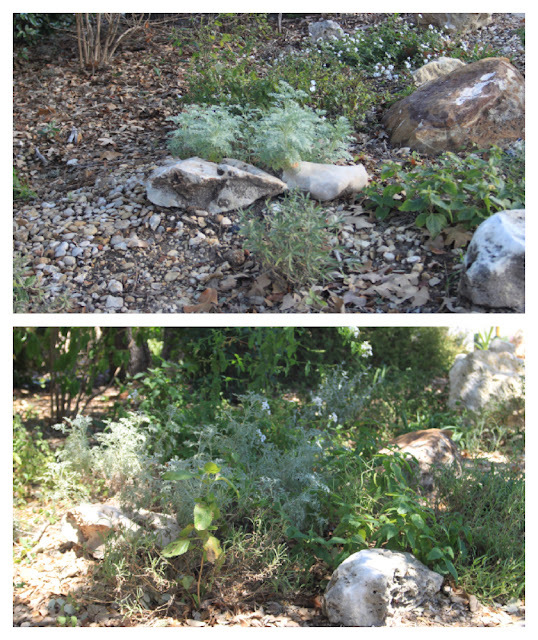 Russian Sage in the island bed has underperformed this year and is obviously declining. It will be replaced with low maintenance yucca and a new blooming plant. You can see how this spot should look in the photo second from the right in my blog title collage. The Creeping Germander continues to creep along, although slowly. Across the way the Hamelia patens and Flame Acanthus (Aniscanthus quadrifidus var. wrightii) are not getting enough sun to bloom and Calistemon 'Little John' continues to grow very slowly and I need to check to see if it is in too much rock. Typical of the rest of the area, the blue Plumbago is also the best bloomer here. There you have it, the part of my yard I see most often is not looking the way I'd like it to look at all. Far from being discouraged, I plan to rework the problem areas as soon as the weather cools off. This will be an opportunity to apply what I've learned about gardening in San Antonio over the last three challenging years. Butterflies are covering the flowers in the new wheel garden and I'm enjoying them each morning before it gets too hot. The wheel garden was intended to turn an eyesore into eye candy with plants that can take the full-sun heat of August here in San Antonio. 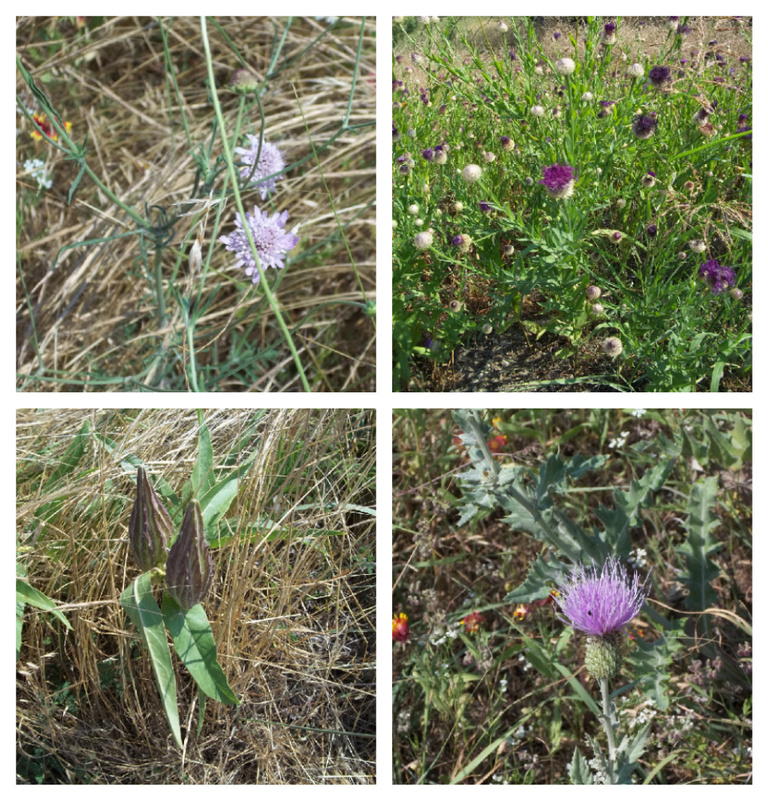 It's a bonus that these heat and drought tolerant plants are also popular with butterflies. Queen butterflies (Danaus gillippus) particularly like the blue mistflower (Conoclinium greggii). They prefer the spent, slightly dried blooms of the mistflower so I'll hold off trimming these back for fall bloom. Yesterday I found this Queen Butterfly caterpillar on the tropical milkweed. I was planning to attract monarchs but there may not be any milkweed left when the monarchs begin their migration through here in a few weeks. Queen Butterflies look a bit like their monarch cousins though they are smaller and lack the distinctive "stained glass" pattern on the wings. 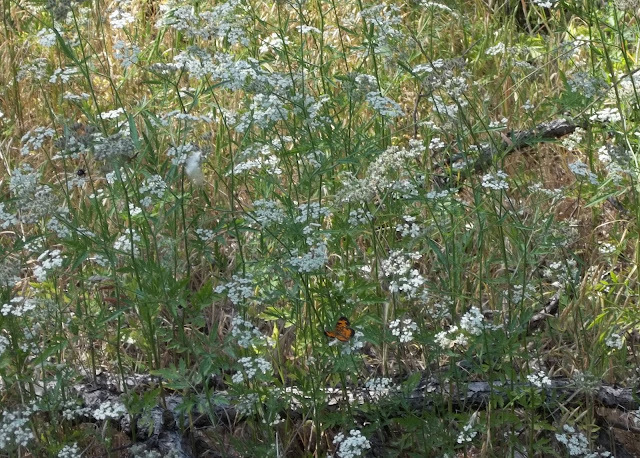 While researching this post I discovered the excellent Texas Butterfly Ranch blog which I highly recommend if you would like more detailed information on attracting butterflies in Central and South Texas. Where in Texas is this? Landscape inspiration is something I'm always looking for when out for a walk. This is a good one for my inspiration file. A nice planting of native and drought tolerant perennials and succulents accented with low limestone walls. 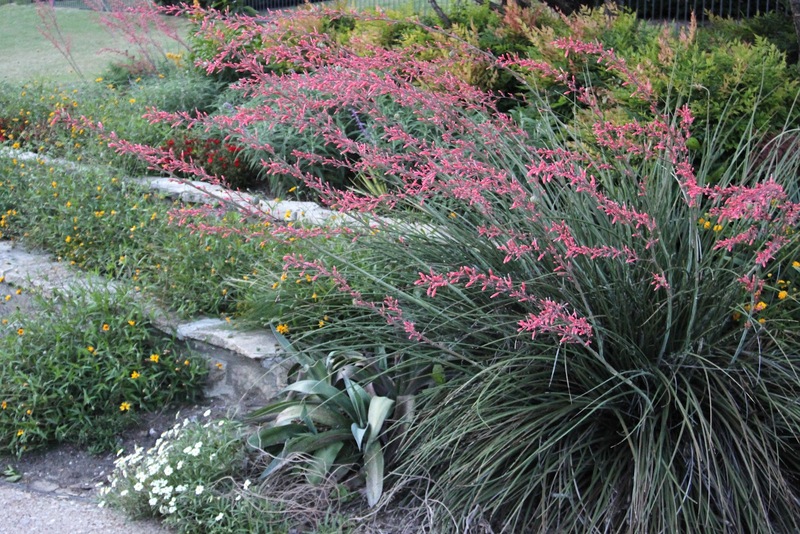 Ashe junipers with hesperaloe parviflora, zexmenia, Manfreda 'Macho Mocha', blackfoot daisy, yucca, lantana, nepeta, and nandina are all great selections for San Antonio. Except this is not in San Antonio or even Central Texas. Let's take a look at the wider shot. Juniper as ground cover? 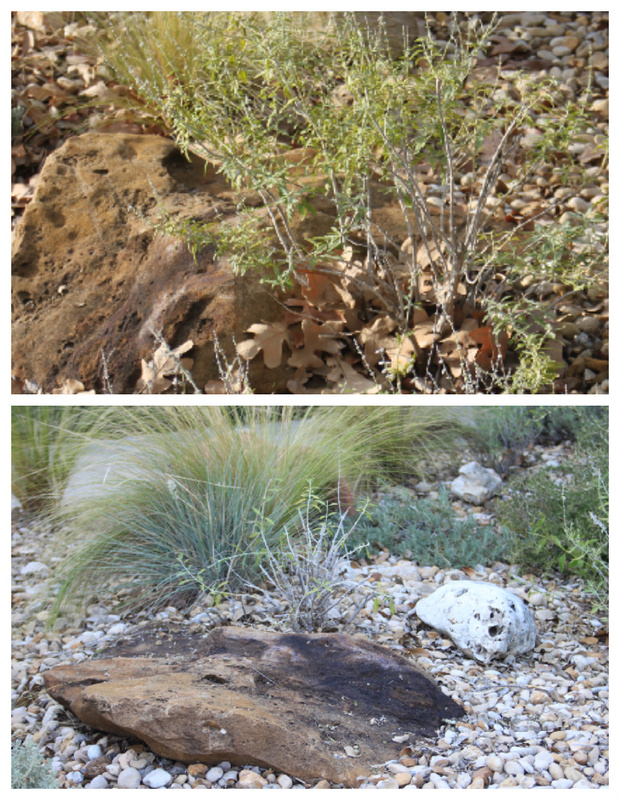 Juniper ground cover would burn out in a San Antonio summer so it's pretty rare. 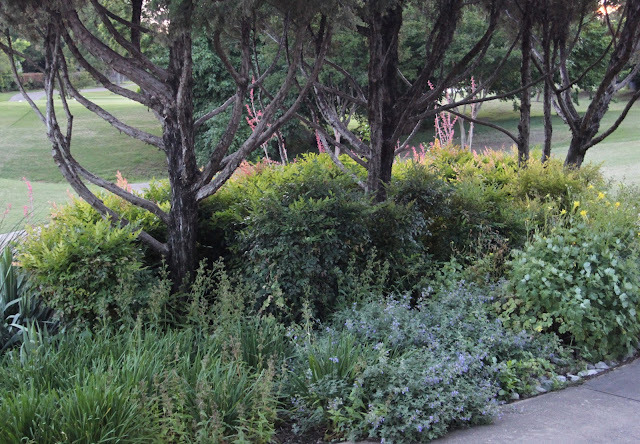 This landscaping is on a golf course in Plano, Texas, about 300 miles north of San Antonio. I'm pretty sure this space was planted with boring, water-guzzling annuals in past years because I don't remember noting anything special about the landscaping here before. 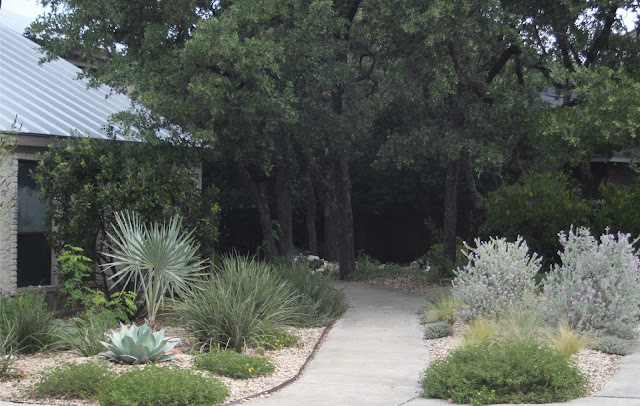 The drought has brought changes to landscaping in Plano and more xeric combinations like this one are popping up all over town this year as a result of water restrictions. I think it looks far more interesting too. Oh, and the sunset we were there to watch was nice too. On a visit to Plano, Texas last spring you may remember I visited Plano Prairie Garden and with the help of my sister-in-law also made a new discovery. 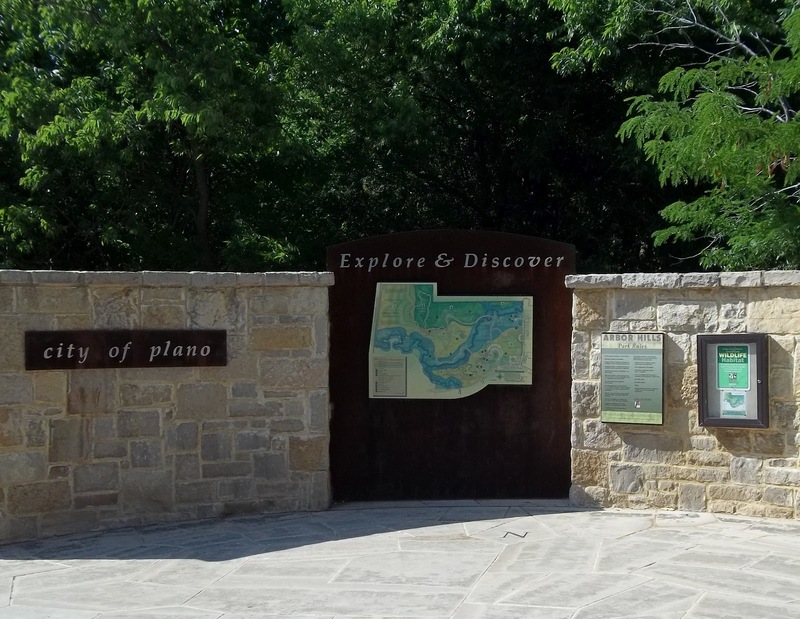 The City of Plano established the Arbor Hills Nature Preserve to protect a bit of the original landscape from encroaching development. This sign provides information on the three ecoregion you will find in the park--Blackland Prairie, Riparian Forest, and Upland Forest. A detailed description of each is at the bottom of the website. The day we visited was a typical north Texas summer day: hot, sunny, and windy. Our goal was to get some exercise so these photos were taken on the fly with my smaller camera. Beyond the prairie we entered the cool, shady Riparian Forest zone. Creeks with water always draw me in because our creeks only have water immediately after a rain. I was particularly interested in the limestone cutaway along the trail. Even though we are nearly 300 miles from home, this is very similar to my own yard with a thin layer of soil over rock. It's amazing how roots of established plants make their way down through the rock bringing soil with them. Then we headed to the Upland Forest area which was an even bigger surprise than the preserved prairie. 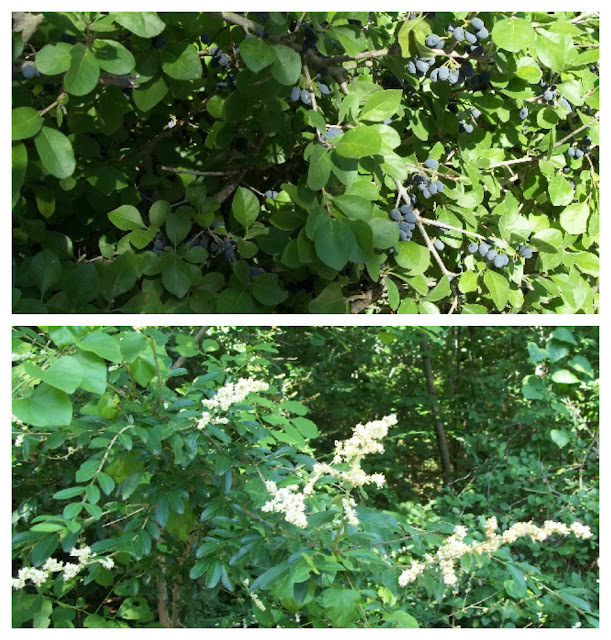 I had not pictured a forested area in the vast suburbs of north Dallas. 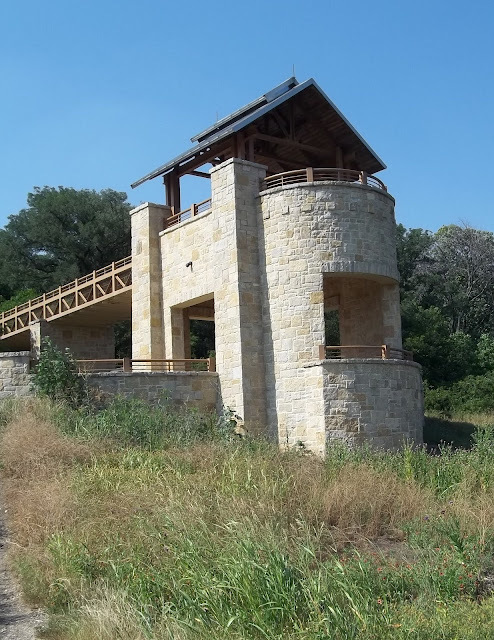 It's an excellent place to walk with paved and unpaved trails for walking and separate designated mountain bike trails. I'm not sure this blue salvia is native here, but it looked good with the queen anne's lace. At the top of one trail is this nice picnic pavilion, there's also a nearby parking lot for those who choose not to walk up. 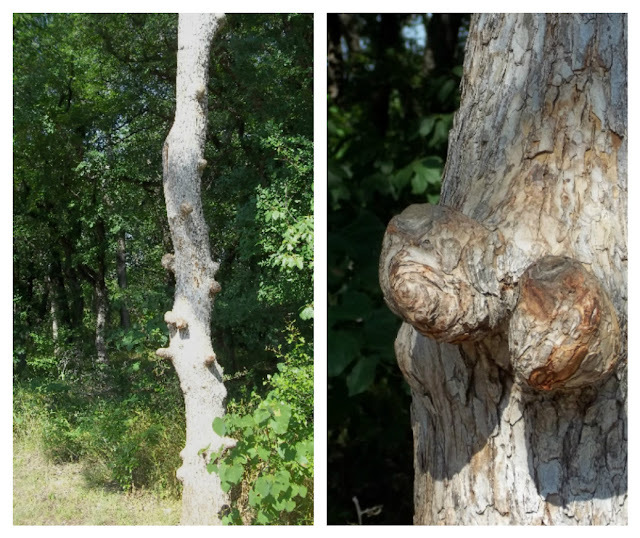 A few more observations along the trail included this very knobby tree. I tried looking it up, but couldn't find any information. A few of the blooming and fruiting plants observed here. The summit has an observation tower overlooking the park and some of the nearby houses. Along the way my sister-in-law pointed out this savanna-style prairie her children loved to visit because it looked like the Africa they knew from their favorite Lion King video. The youngest is a sophomore in college now, but they still enjoy walking here when they are home. It was a fun place for a good walk and to explore.